This study reports on the Terahertz (THz) emission of semi-insulating Gallium Arsenide (GaAs) substrate coated with Zinc Oxide (ZnO) thin film via spray pyrolysis. Using a reflection-mode THZ time domain spectroscopy (TDS), it was shown that enhancement in the THZ emission was observed with ZnO-coated SI-GaAs compared to the bare substrate. The enhancement is partly attributed to the decreased reflectivity due to the modification of the surface by addition of a ZnO thin film on the GaAs substrate which translates to higher photon absorbance of the material. A. Escaro, E. J. C. Solibet, R. Veloz, N. I. Cabello, M. Bacaoco, L. Lopez, M. A. Faustino, A. De Los Reyes, A. Cafe, E. Estacio, A. Somintac, and A. Salvador. 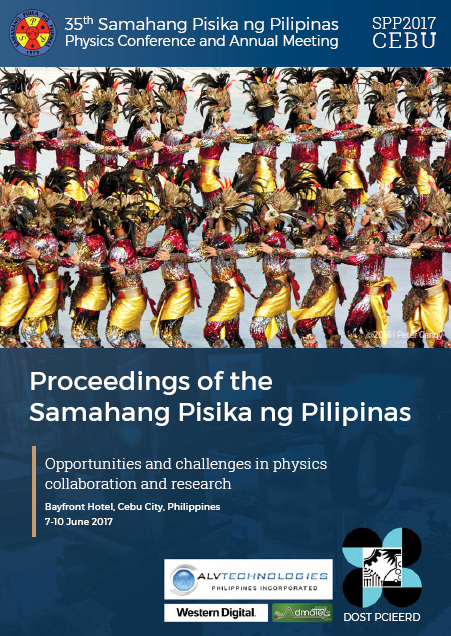 Enhancement of terahertz emission of semi-insulating gallium arsenide via zinc oxide thin film surface modification, Proceedings of the Samahang Pisika ng Pilipinas 35, SPP-2017-PA-03 (2017). URL: https://paperview.spp-online.org/proceedings/article/view/244.